This year we are celebrating STEAM at PPL, and across the City of Pasadena. We’ve got lots of great STEAMy things planned to get you immersed in science, technology, engineering, arts and mathematics. Find out more on our STEAM2018 webpage,, and watch Off the Shelf for more info. 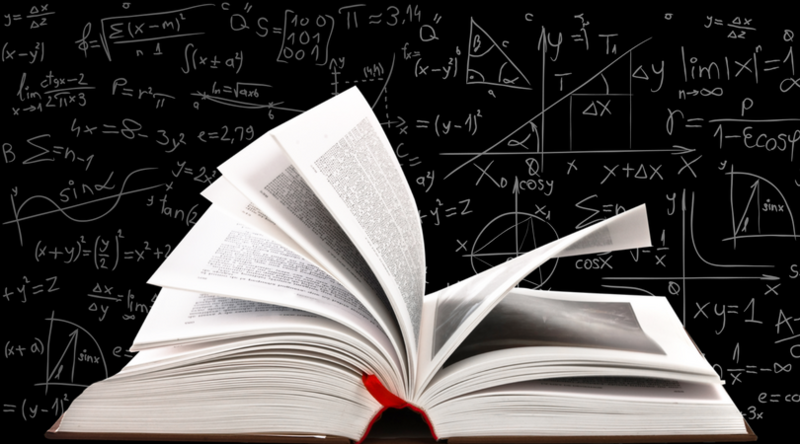 To whet your appetitie, here are some titles about math and mathematicians. Don’t worry, you won’t need to solve any equations and there won’t be a test! Just some good reads. On the world called Arbre, time runs in counterpoint: the ponderous flow of ritual and study behind the doors of the great “maths,” or monasteries, against the constant flux of cultural change in the world outside. Devoted to scientific rather than religious practice, these sanctuaries maintain an austere and ceremonial cloistered existence for decades, even centuries, before opening briefly to see what has changed. Every so often, major outside events break the great cycle and force the maths to change. Fraa Erasmas, a not especially distinguished member of one of these cloisters, finds himself at the center of one of these events and, as so often happens, ends up trying to save the world. Stephenson (Cryptonomicon ) is not afraid to spend as much time as it takes to explore everything that interests him, whether it’s the geometry of cake cutting or the particulars of a 1000-year-old collection of assorted garden furniture. In less skilled hands this might be tedious, but here the layers of world building are the foundation for an enthralling tale that, even at over 900 pages, is over almost too soon. For some fans, this may be a welcome return to sf after his epic historical trilogy, “The Baroque Cycle,” but readers with an interest in science and philosophy will also enjoy it—there are dozens of famous ideas and theorems half-hidden throughout the novel. In 1828, scientist-explorer Alexander von Humboldt (1769-1859) summons the great mathematician Carl Gauss (1777-1855) to join his party to Berlin, where he is to be feted before embarking on an expedition across Russia to the Urals. The perpetually testy Gauss, whose great trial in life is that everyone else thinks so slowly, which makes virtually any kind of human interaction infuriatingly boring for him (though he does fancy a fine young figure), would go back to sleep, but his wife, Minna, whom he barely tolerates, rousts him out and gets him on the road with youngest son Eugen. They no sooner arrive at Humboldt’s mansion than Kehlmann diverges to recap his two principals’ lives and careers in chapters alternately concerned with globe-trotting aristocrat Humboldt and genius-from-the-gutter Gauss, who willingly leaves home only to earn a living and escape Minna. The uncomfortable humor of being, in Gauss’ case, too brilliant (he frequently bemoans having to live before the innovations he foresees can be constructed or even understood); in Humboldt’s, too focused (he scrupulously abjures whole theaters of human experience to concentrate on measuring), suffuses Kehlmann’s heady historical novel, which may especially delight science-fiction connoisseurs. After the death of her mathematical genius father, Catherine, who gave up her own study of mathematics to tend to him, claims that she is the author of a mathematical proof found in the attic among his unpublished, mostly incoherent notebooks by Hal, one of his former students. But what “proof” does Catherine have that she, and not her father, is the author? Her older sister, home to attend the funeral, doubts her claim and, in fact, doubts Catherine’s own sanity. Hal, who has professional ambitions of his own, isn’t exactly disinterested and may not be trustworthy; his sleeping with Catherine has also complicated the issue. The elusiveness of genius in general and the difficulty of a mathematical proof in particular here become metaphors for the uncertainties of love, trust, and personal integrity. This wonderful play has already won the Kesselring Prize for Auburn, also a recipient of a Guggenheim Fellowship. Proof’s deft dialog, its careful structure, and the humanity of the central characters are themselves proof of a major new talent in the American theater. One of DeLillo’s first novels, Ratner’s Star follows Billy, the genius adolescent, who is recruited to live in obscurity, underground, as he tries to help a panel of estranged, demented, and yet lovable scientists communicate with beings from outer space. It is a mix of quirky humor, science, mathematical theories, as well as the complex emotional distance and sadness people feel. Ratner’s Star demonstrates both the thematic and prosaic muscularity that typifies DeLillo’s later and more recent works, ke The Names. The collaboration of two such eminent sf writers as Clarke and Pohl being a rare thing, perhaps it’s no surprise that the result is really two stories: one about a Sri Lankan mathematician (Clarke lived in Sri Lanka) who proves a rather alarming theorem; the other about something yet more alarming, invasion by grand galactic aliens. The mathematician is regarded as heretical or at least a security risk by a broad range of authorities that Clarke and Pohl depict with the satirical bite each has shown before. After the invasion threat becomes impossible to ignore, security worries must be muted because the theorem is also a potential point of agreement for the various faiths, factions, ideologies, and bureaucracies that have hitherto been squabbling like tomcats on a fence. Pacing is slow at timesâ€”some readers may recall the similar effect of physicist C. P. Snow’s mainstream novels about scientists confronting puzzles and folliesâ€”but accelerates as the aliens approach. In the end, the readers will have a most respectable swan song for two authentic giants. Based on real people and events, Leavitt’s copiously researched new novel focuses on a relatively narrow world that he nevertheless illuminates into its deepest recesses. Eventually becoming one of the greatest mathematicians of his era, Srinvasa Ramanujan was only a 23-year-old bank clerk in the Indian city of Madras when, in 1913, he wrote a letter to the highly esteemed British mathematician G. H. Hardy, who was seated at Cambridge. The letter suggests to Hardy that the writer is a math genius, and Hardy embarks on a campaign to bring him from India to England. Once there, the relatively bland Ramanujan nevertheless stood at the center of many people’s personal and professonal lives for a brief time before his untimely death. Leavitt explores the legend that gew up around Ramanujan, finds what is real in the myth that shrouded his actual being, and in the process reaches impressive heights of understanding the psyche of the intellectual as well as those who seek company with the brilliant-minded.